"He sees you when you're sleeping. He knows when you're awake. He knows if you've been bad or good so be good for goodness sake!" So are our children warned in one of the season's most popular tunes, "Santa Claus is Coming to Town." Heaven forbid one ends up on "The Naughty List." For the uninitiated, this is the list that is kept by The Great One (no, not that one) who has the final say in what children receive -- or don't -- on the morning of December 25th. 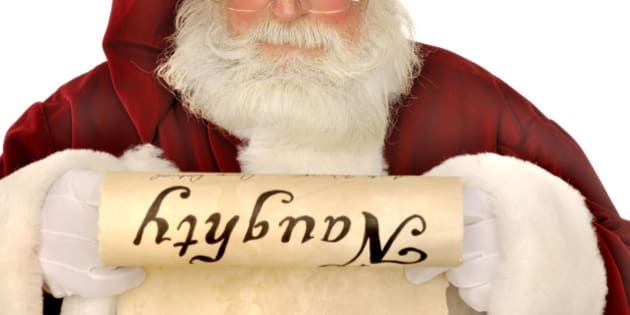 You see, the threat of being relegated to "The Naughty List" is what may be one of the only things that keep kids on the straight and narrow in those weeks and months leading up to Christmas Day. Santa and his all-knowing, all-powerful ability to "see" what's going on and to be the sole arbiter of decisions regarding behaviour throughout the year provides some semblance of order and obedience by anxious children, at least for a month or two (or three) leading up to the big day. Oh, yes -- there is the "Elf on the Shelf" who, in some homes, is also keeping an eye out for their boss, but these imps' abilities to actually have decision-making capacities is questionable, at best. They may indeed report back to Santa but it is the big man in the red suit who determines what child is getting the goods and what child will be disappointed to say the least to receive that proverbial bag of coal on Christmas morning. By many accounts, the threat seems to work, but one has to ask: is it really necessary? If a child was indeed "naughty," and deserves no more than a lump of coal in her stocking, what's the problem with telling her so? Why offload the delivery of the bad news to the man in the red suit? For the weeks and months leading up to Christmas Day, children around the world are on their best behaviour, in large part because of the constant reminder that the all-knowing, all-seeing Big Guy from Up North is watching their every move in an effort to determine whether all of their Christmas morning dreams will come true...or not. All things considered, the lead-up to Christmas gives parents a break from always being the "heavy." For a short while during the year, we get to delegate this parental responsibility to someone who appears to have the power to do what so many of us cannot: get their child to behave. Perhaps it's our collective feelings of guilt about having to be the disciplinarian for most of the year that relegates many of us during the holiday season to giddily remind our kids that "Santa's watching." We are, if only for a fleetingly short period of time, able to offload any responsibility for bad behaviour to an omnipresent figure who will mercifully deliver -- or mercilessly not deliver -- the goods come Christmas morning. After all: Santa sees all, knows all, and determines who gets what, so Moms and Dads are, for once, off the hook. It's easy to get Santa to do our "dirty work" for us for us once a year and relinquish us from any responsibility we may have otherwise had regarding being "The Heavy." Financial considerations aside, it's much more difficult to look your child square in the eyes and tell them that they didn't receive the requested gift(s) because their bad behaviour didn't warrant positive reinforcement. Indeed, Christmas may present a welcome though fleeting relief for a time every holiday season, releasing us from the more unpleasant responsibilities of parenting: saying "no," or disappointing our child. Though it's easy enough to coast along, leaving Santa to be the one deciding our child's toy fate, perhaps we should reconsider this tact and do the "dirty work" ourselves. After all, it's our responsibility to teach our children well, even when the lesson being taught is not one that the child particularly wants to learn. As difficult as it may be, this holiday season may present an opportunity to start a discussion with your child about their behaviour, good or bad, Santa Claus notwithstanding. A child who has been deemed "naughty" should very well be told so by their parents, and no one else. Santa may be an easy messenger through his actions (or lack thereof) but the real lessons that will be learned and remembered by children are the ones that come from their mothers and fathers. As difficult as it may seem, the naughty behaviour that warrants discussion should not be made the responsibility of the big guy in the red suit. In other words, parents should take a page from their own well-worn playbook and follow one of the most important rules of all: honesty is the best policy.